Thank you! Click HERE to download the DIY Kiosk Guide PDF. Reduce buddy-punching and speed-up lines. Pre-configured and pre-integrated for your district. Touchpoint’s line of fully-vetted USB scanning components and laptops enhance the functionality of your already-existing technology. Our pre-configured scanners facilitate the integration of your existing badges with Frontline’s Time & Attendance system. 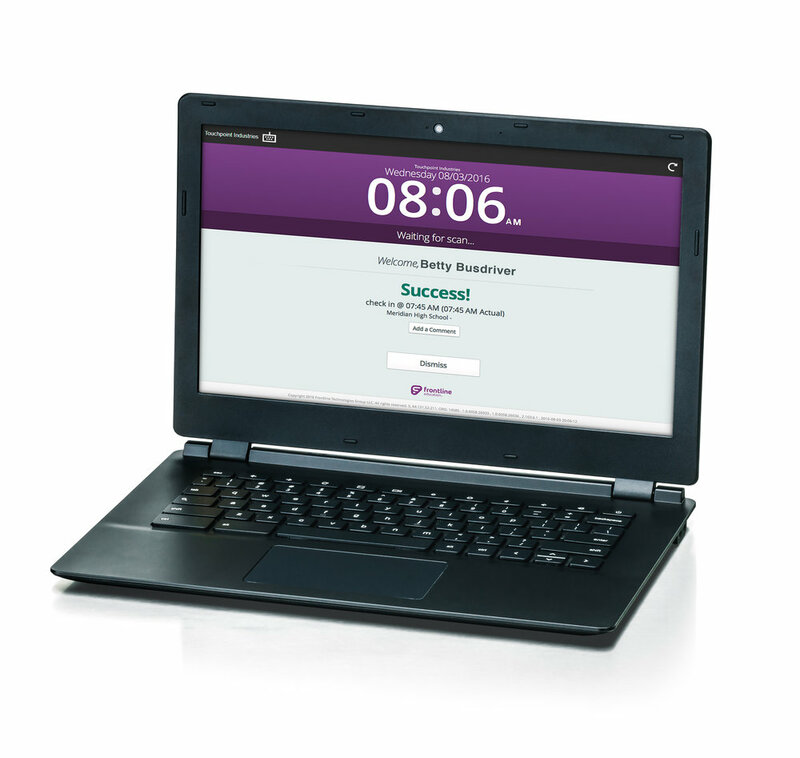 Eliminate guesswork and compatibility concerns with a Certified Laptop. Tested and verified to effectively work with and meet all hardware requirements for Frontline Time & Attendance. Your IT department will be responsible for the physical and digital lockdown or kiosk mode. Integrate your existing badges without being an IT expert. We first test and verify that your badges will work seamlessly and accurately with your Time & Attendance software; the scanners are then calibrated and programmed accordingly. They will arrive pre-configured, pre-integrated, and pre-tested to guarantee compatibility with your system. Simply plug them in and start scanning! This single-line, USB barcode reader is the most economical choice for expediting clock-in lines. We pre-test and pre-configure the reader according to your software and guarantee it will work right away out of the box. Reader will work with barcodes printed out from your system as well as integrate with most existing barcodes already on your ID cards. Easily make your own terminals buddy-punch-proof with the addition of a Biometric Finger Scanner. The verification and identification in our scanners are the best in education and currently used by hundreds of thousands in school districts across the country. With some help from our friends at identiMetrics, you can ensure your employees can never buddy-punch (and never need to worry about forgetting their finger). This Omni-Direction Barcode Reader is one of the fastest on the market. Now your users can hold the barcode any direction, and the reader will automatically adjust and scan immediately. Poor print quality and low light are the biggest reasons a good barcode is not read. This LED eliminates both issues resulting in a quick process and less complaints from users.